Friday night found R and me trying out a new-ish wine bar before we made our way to the First Friday opening at Gasworks Gallery (which benefits MashedPotatoes.org). Our destination was Queen Anne and Bricco Della Regina Anna which has been open since spring 2006. The evening started off a little iffy as she hit bad traffic on the way over and I was also running a bit late. Adding to the confusion I had switched the digits in the address in my head and suddenly found myself on the complete wrong end of Queen Anne Avenue! Amazingly enough I finally got myself straightened out and was parking just as R pulled into the area and waved to me as she sought out a space. Bricco is a tiny, cozy place with only 6 or 7 tables, seating for 10 – 12 at the bar, a window ledge for 6 and a couple of narrow stand-up ledges between the tables and the bar. The tables are reserved for those planning to dine and so when we arrived we had a choice of squeezing in along the window or standing. We opted to stand but we were second guessing that decision as the hosts squeezed more people along that little ledge. We each had a glass of wine from the "by the glass" menu (pdf – page 4) and had wanted to order a little bite to go along with. Eating at the stand-up bar would have been difficult, if not impossible – at least at this time of year. The surface is narrow and although the owners have provided hooks under the bar there really isn’t enough room to hang full-length coats and a handbag, too. I commend them for at least thinking of hooks, though. The other thing that I highly commend them on, is that they kept track of who had been standing/waiting the longest and as places opened along the window or at the bar they were offered in order of arrival. When places opened at the bar, two people who had just walked in started to take them and the staff told them they would have to wait as others were ahead of them in "line". Being the one waiting I really appreciated this. However, I also happen to pride myself on my "vulture" skills and may have been a bit put-off if the roles had been reversed. Not really, but it does mean no matter how good your eagle-eye and maneuvering skills are they won’t be a real asset to you here. 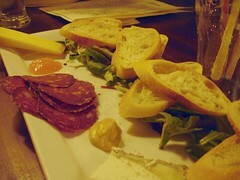 Once at the bar we scanned the menu and opted to go with a simple cheese and meat plate. There are a ton of options for you to choose from. We settled on Mole salami -one of our favorites from Salumi- and for cheese we chose Comte and Humboldt Fog. 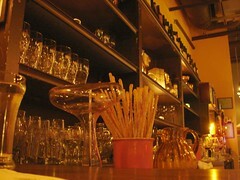 We also asked for a couple of the grissini we had seen sitting behind the bar in a big crock. Apparently, while they used to sit on the bar the health inspectors weren’t happy with that and they now are available but not quite so readily. After we ordered our little snacks we settled into a second glass of wine and enjoyed the neighborhood feel of the place. There are several things I really like about the place. The people seem really nice; the wine selection is interesting – and I mean that in a good way; the food looks delicious – hard to judge when you are eating meat and cheese but even our plate was thoughtfully arranged and complemented with a sweet jam and spicy mustard; and the location makes it feel very welcoming. The smallness though is something to be a bit wary of. The window seats were okay but a bit tight;in the dining area the tables are all along one wall with barely room to squeeze between them – don’t plan on any private or intimate conversations here; as mentioned the stand-up area is not great – although it would probably be better in summer when the bulky clothing factor goes away. 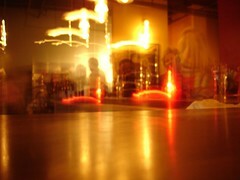 So the best spot is at the bar and that is fairly limited. I will definitely come here again but if I do I’ll have a back up plan. If the place seems too crowded or I’m too far down the line for getting a spot at the bar I’d probably just head somewhere else – at least if I"m expecting to eat. Having said that though, I think you should give it a try. 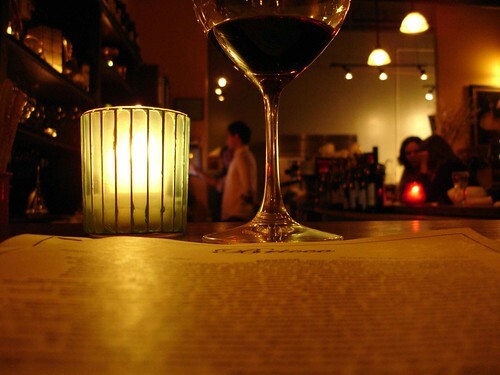 In addition to dining, they plan to offer monthly wine tastings and sometimes hold events. Those could be fun.